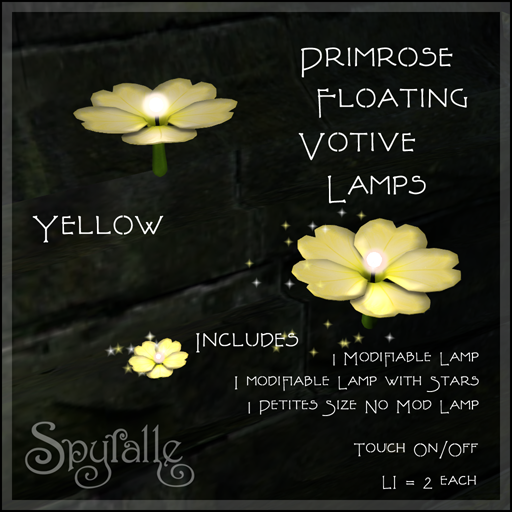 Floating gently in the twilight, the Primrose Votive Lamps shed benign light (and a little fairy dust) on your spring celebrations and ceremonials. 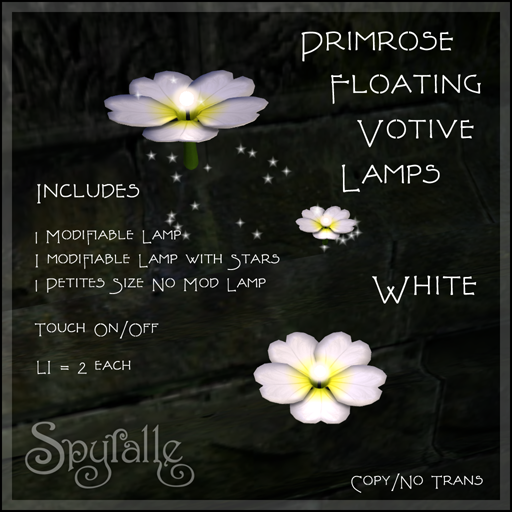 These original creations by Kerryth Tarantal of Spyralle, scripting by Tailahr Winnikow, were introduced at Ostara’s Altar, the solstice event from Dark Passions. Four colors are available, separately or as a set. 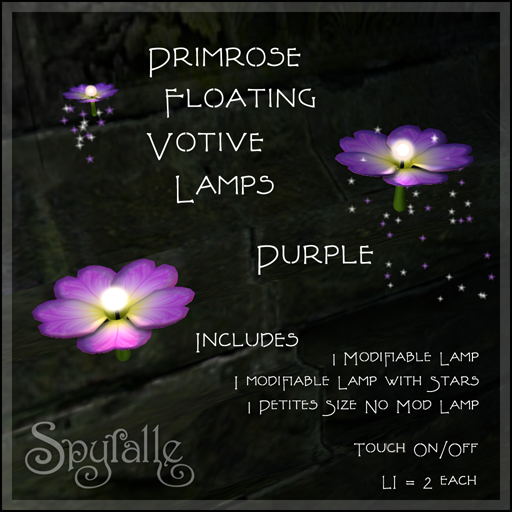 Each package includes a full size lamp (they are actually quite small) with particle stars, a Petites scaled lamp with particle stars, plus a modifiable lamp without stars. When activated by touch, the lamps light up and begin to float slowly in the air within about one meter of their original position. 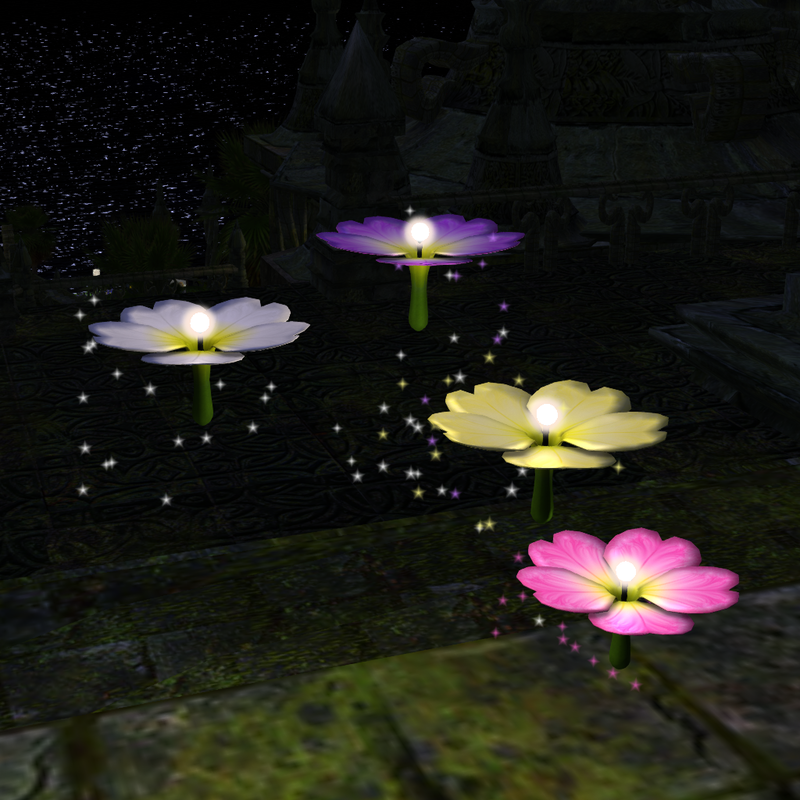 The touch toggle also turns the particles on and off. Detailing on the petals is based on new fractals in Kerryth’s Floriade series. 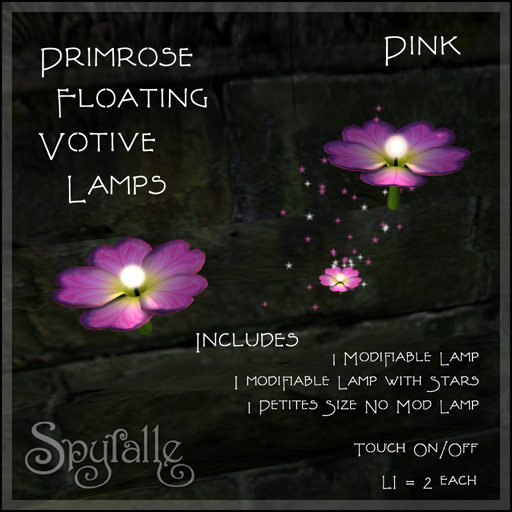 Spyralle also had a prize in the 5 linden hunt at the event – the first release in a new color series of Haze pottery. 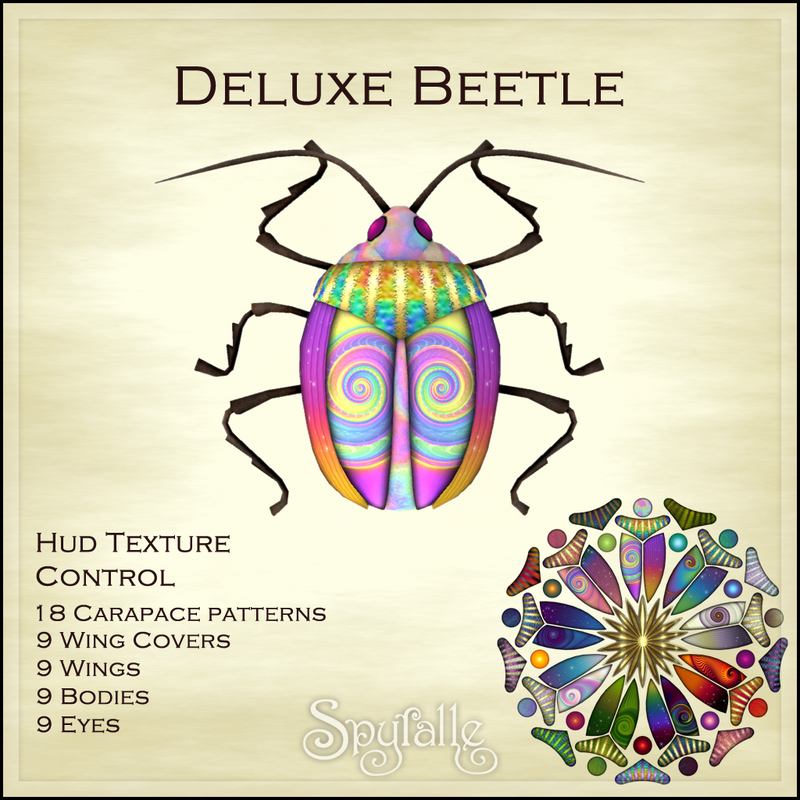 Spyralle Studio members have been treated with a new gift this month – the third in our series of deluxe mesh insects with colorful texture choices via the mandala HUD. A wearable version is included. This one has so many options for the different parts you can create over 1000 beetle species. And, you can display them! 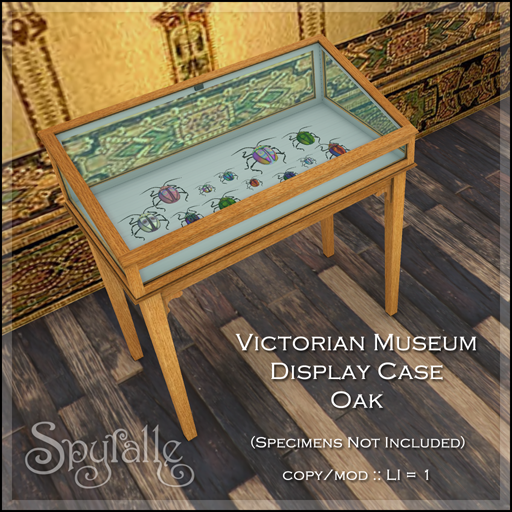 This display case crafted in oak is the perfect setting to display your collection of beetles, butterflies, antique gloves, grimoires or what have you. This is also a gift for the group. Members should check notices for information. The display case comes with a framed copy of the mandala. AND! You should totally photograph your Beetles! Spyralle has a photo contest for pictures of our insects. The deadline is March 31. There will be up to 6 winners. See group notices for details. Sometime in the imagined future of the Past, there are fantastic airships, humming impressively across the morning sky, propellers turning slowly, rivets sparkling. A member of the night crew, going off duty, opens the sensory mask of his bronze helmet and looks back toward the blinking lights on the mooring tower from which the ship departed moments ago. A story begins. 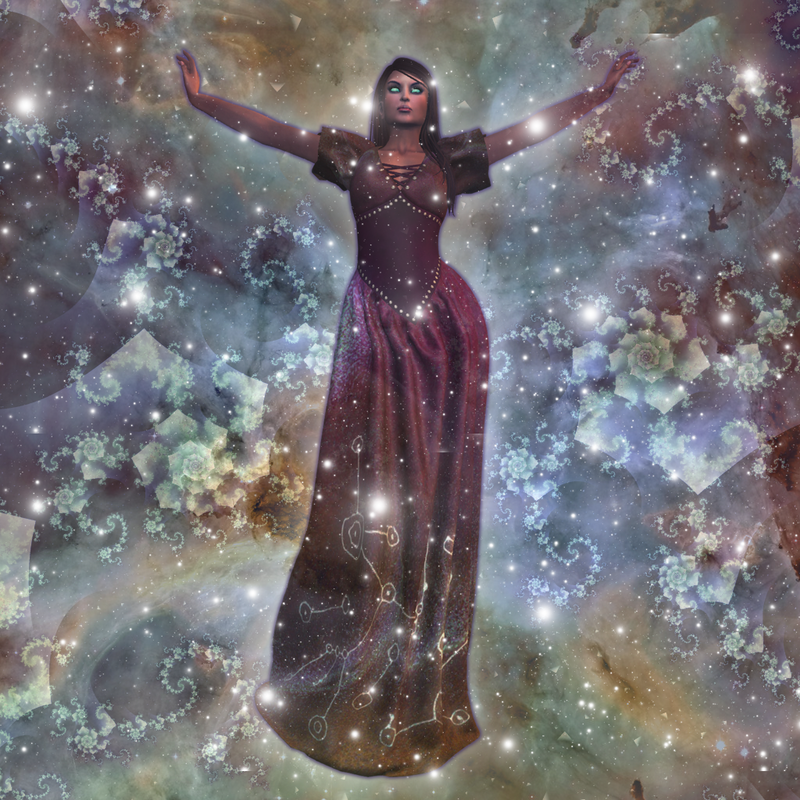 You make the story in your role play, in the many worlds of Second Life where role players gather, interact and build narratives of adventure, drama, love and mystery. And every month, creators offer visual ingredients for your stories at We Love Role Play – the market event for role players of all kinds. 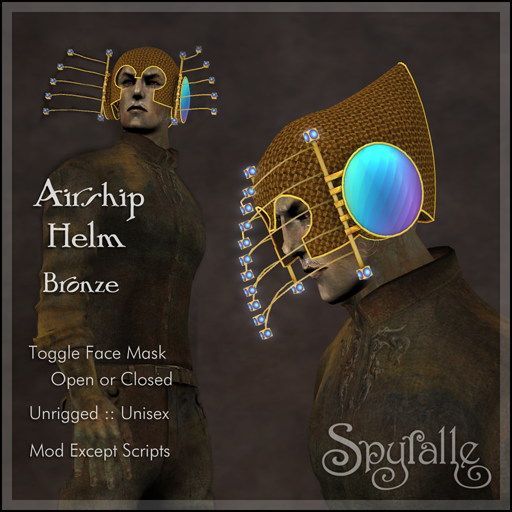 This month Spyralle joins We Love Role Play with a new exclusive that covers the spectrum from Steam Punk to classic Sci Fi – and maybe an Elvish scenario or two. 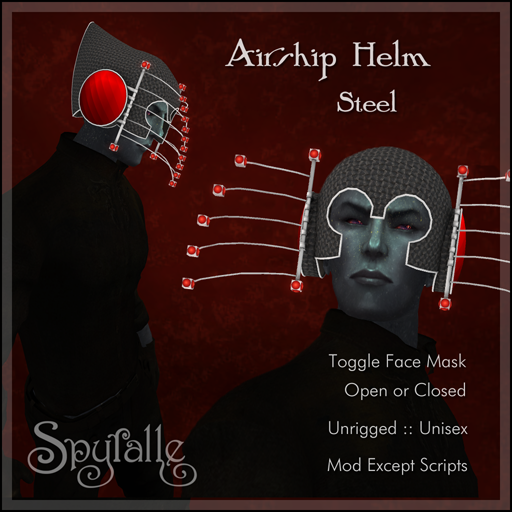 The Airship Helm is fitted to the male avatar but can be modified to smaller heads using Edit. The face mask opens and closes with a touch of the lighted panel on either side. The illuminated panels are details of original Kerryth Tarantal fractals from the “Heaven’s Gate” series. The event price is 50% off. March’s WLRP continues through the 31st. Shapes, skins and outfits from Fallen Gods; eyes by IKON. Steam Hunt XIV (March 1 – 31) is a free, themed hunt presented by Historical Hunts, Ltd. Spyralle participates in most HHL hunts and recommends them heartily – for the themes, the prizes, the community and the fun – which usually includes a themed event with games, rides and shopping in one of the Mieville regions. The hunt theme this year is “Steam Me Up” – a wink of the eye toward a fan favorite from popular culture of the last 50+ years (you can probably guess!) and an opportunity to imagine interstellar travel in the steampunk genre. Averaging things out, this places us more or less in Buck Rogers territory. Spyralle is happy to oblige! 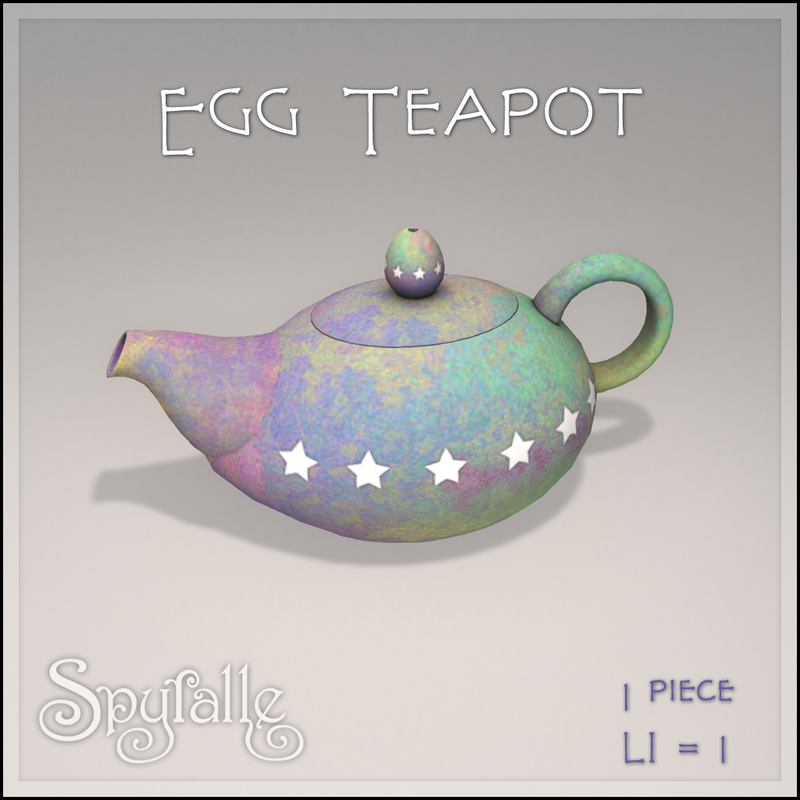 Shown above is our Steam Hunt prize, which intrepid hunters can find at Spyralle’s main store. Collect a hint from the hunt poster at Spyralle’s main store entrance. For our mesh and textures by Kerryth Tarantal and scripting by Tailahr Winnikow. 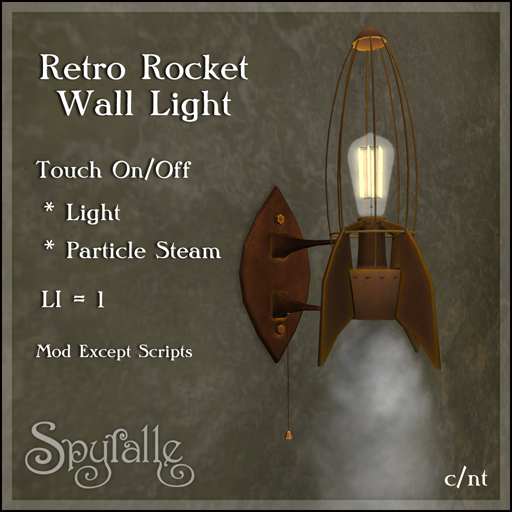 At the Exposition, if you make your way out of the entry room and down the stairs, you can find the Spyralle booth if you get down to the lower level of shops – fly or take the elevator. This photo shows the two updates I’m so happy to have completed. The Orrery Jewel version of our Victorian Walking Jacket now includes sizes for popular mesh bodies – and now that it has reached this stage, there’s a possibility of other Orrery fractal patterns in a future release of the jacket, either in the Park Place shop or on Marketplace. 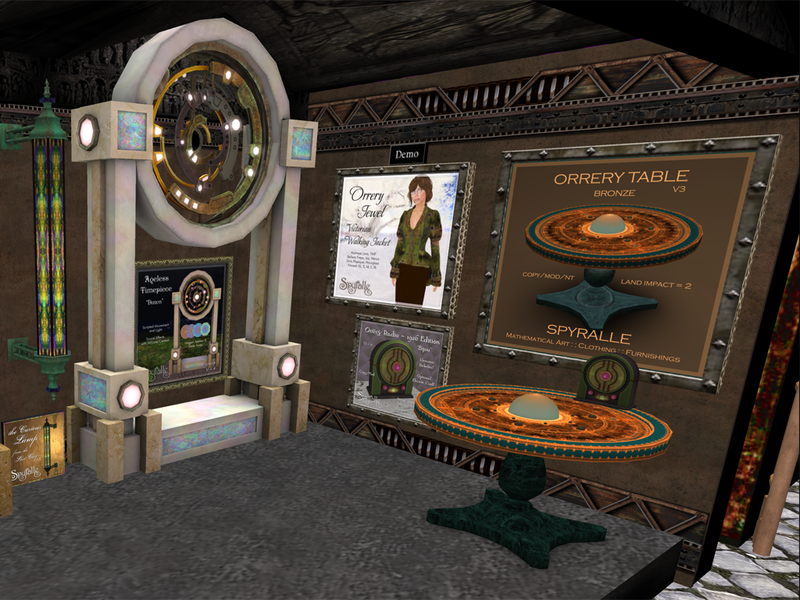 Our first Orrery fractal creation was the Steampunk table, weighing in at 26 prims. Here it is – all mesh and down to TWO land impact. The Orrery table will proceed in two directions from here – restoring the other original colors in this original design and a complete revision with a new base and moving parts. Stay tuned! Spring’s Twisted Hunt is here! Twice a year you can have the fun of trying to outwit this most difficult of all-over-the-Grid prize seeking and fiendish puzzles. Spyralle is never as fiendish by design as some places, but things have a way of blending into the architecture and landscape of our main store so they can be very hard to see. That is fiendish enough sometimes. And we do move our prize around. It’s the lease we can do. 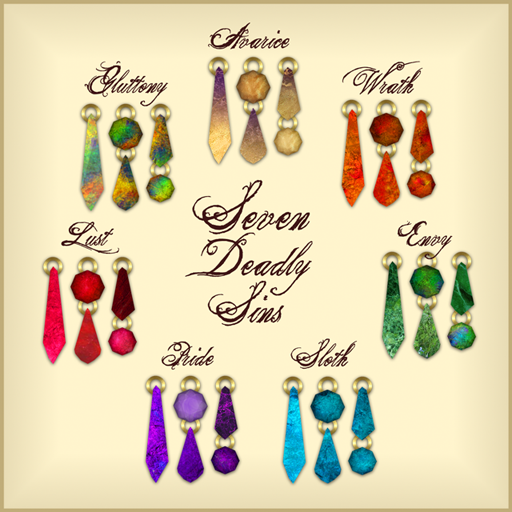 The theme of this spring’s Twisted Hunt is “Divine” with the color Gold. 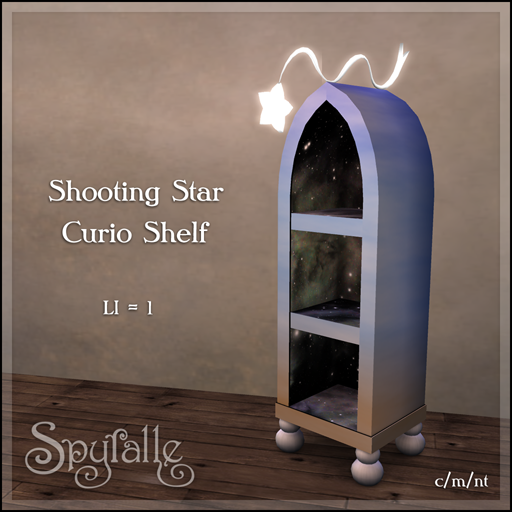 We’ve gone celestial with this sky-inspired curio shelf with a galaxy inside, just the right size for a few knick-knacks or collectibles (eggs!) or toys or miniature potted plants. Wouldn’t it be fun in a child’s room? The star casts a warm gentle light to keep the monsters-under-the-bed at bay. The Twisted Hunt runs through March 31. Good luck! 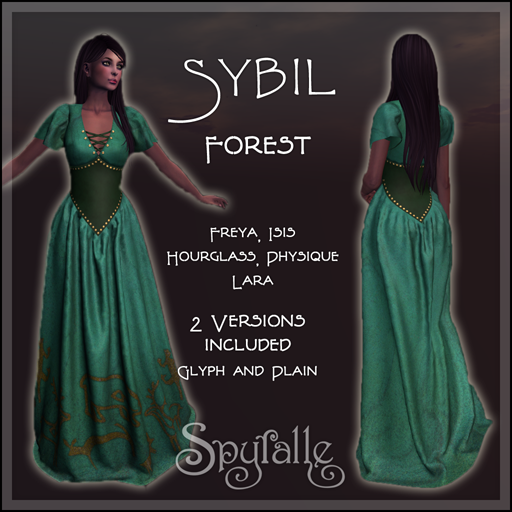 Inspired by ancient petroglyphs from around the world, Spyralle’s new dress Sybil speaks of the fascination our ancestors felt at the grandeur and mystery of the natural world. Sybil made her debut at the the Spoonful of Sugar Festival late in 2018. She has now returned in new hues to the Medieval Fantasy Fair. Each color of Sybil represents a face of stone tinted in the colors of a type of natural landscape – contrasted with fine suede leather and gold or silver studs. Here, the vivid greens and blues of a burgeoning spring in the meadows and pools of the marshes make a backdrop for long-legged wetland birds carved in limestone. Sybil Marshlands is a 100% Relay for Life donation at the Fair. 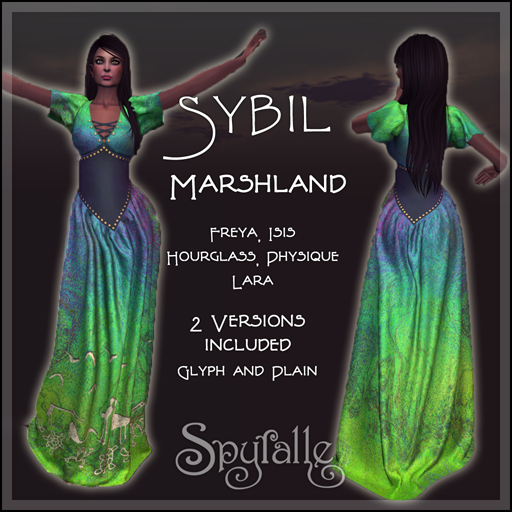 Each color of Sybil comes in two versions – one with the petroglyphs and one with plain stone. Each color has a different frieze of carved or painted images, drawn from prehistoric art. The stone textures are original fractal images in the Owl Moon category which have been filter processed, retaining the colors of the original fractals. Marshlands, Plains and Forest are the three new colors at Medieval Fantasy Fair. 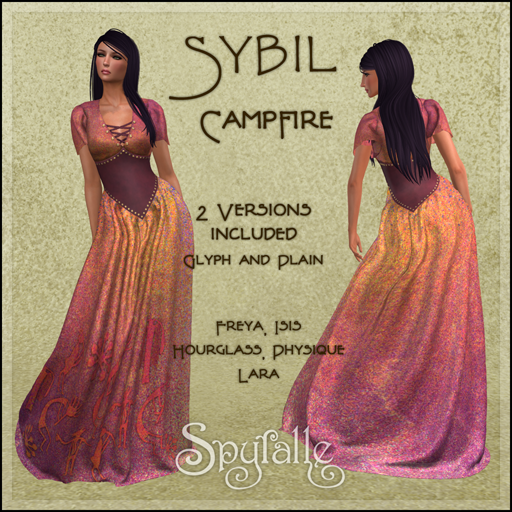 Sybil is sized to fit five popular mesh bodies. All sizes are included. Please try the demo. 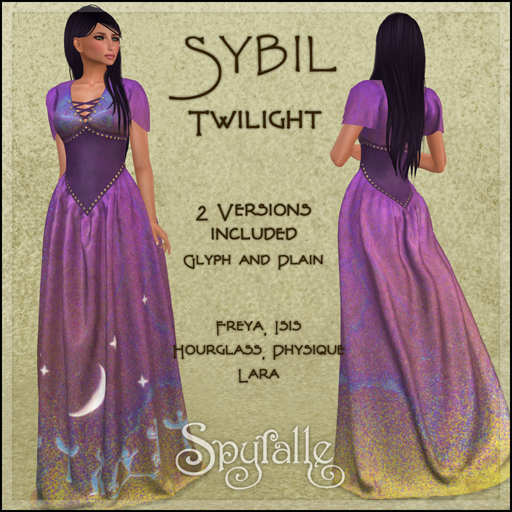 The original colors of Sybil, shown below, are now available Spyralle’s satellite store at Park Place Home. 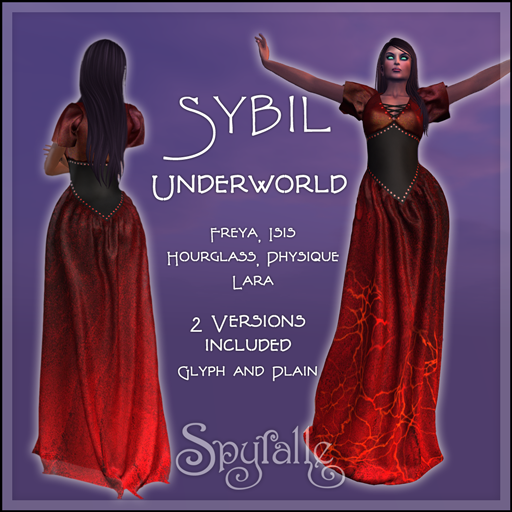 Spyralle Sybil – Underworld : Pele speaks! The model wears the Lara body by Maitreya with custom shapes and Victoria hair from Wasabi Pills. 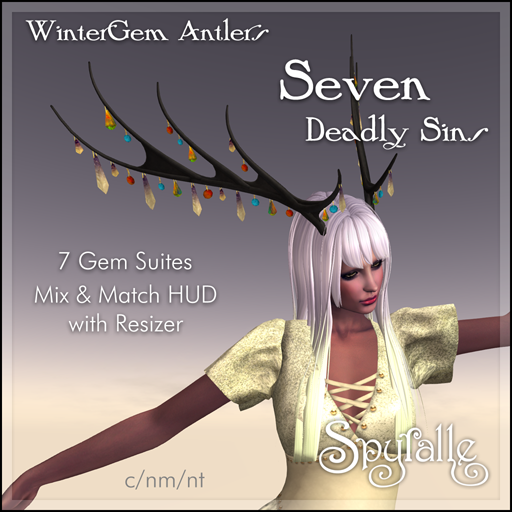 Marshlands, Forest, Plains, Dreaming and Underworld are shown with the Noelle bento head from LAQ and Hailey Gen2 F3 skin from Soul. Ocean, Sky, Campfire, Desert and Twilight are shown with the Rain bento head from LAQ and LAQ’s Valentine skin in Tone 2. Eyes in the first picture are Fallen Gods’ Glowing Eyes; all other eyes by IKON. 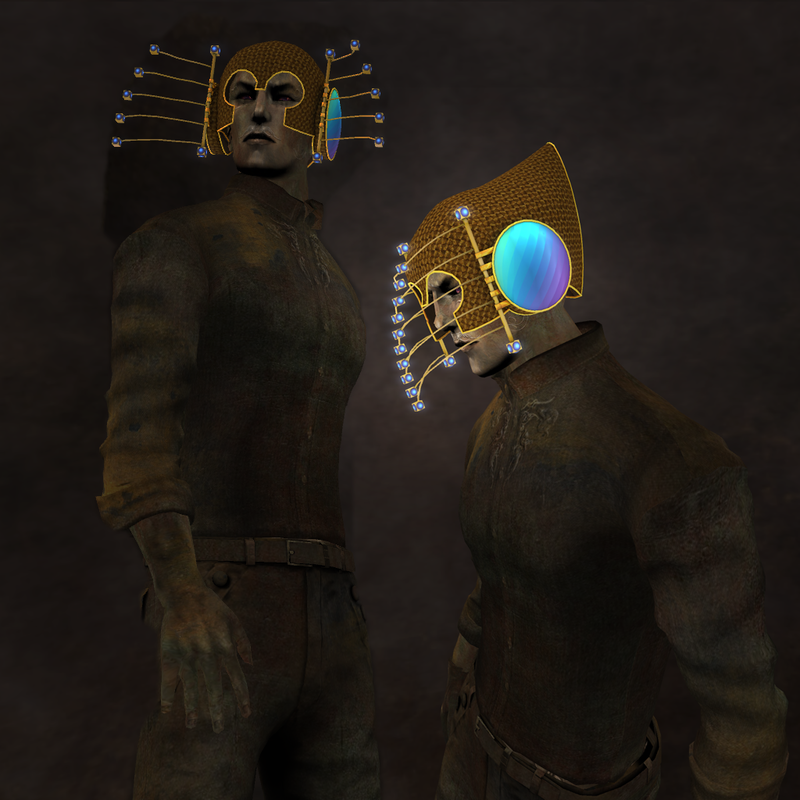 This unisex headpiece comes with a HUD for customization among seven suites of gems. You can also resize with the HUD. There are five types of gems on the headpiece. Each one can be individually customized among the seven suites, giving hundreds of possible combinations.